EDWARDSVILLE, Pa – Wilkes University football ushered in a new era last season as head coach Trey Brown took over the Colonel program in 2014 making his mark on both sides of the ball. After an eventful first season that saw its share of ups and downs, the Colonels look to build on the experience gained last year perfecting Brown’s new style of up-tempo, high octane offense and aggressive defense. Wilkes finished 2014 with a 2-8 overall mark standing 2-7 in Middle Atlantic Conference play. Although the record may not have reflected it, the Colonels were in all but three of those defeats, including trailing by seven or less in five contests late in the fourth quarter. Coach Brown hopes the experience of those situations will prove beneficial in the year ahead. “We need to keep games close heading into the fourth quarter to give ourselves a shot at making those game-changing plays that just didn’t go our way last season,” Brown said. “We have the playmakers and toughness up front on both sides of the ball to make that special play in every close game that is the decider”. The MAC continues to be one of the toughest conferences in Division III, and with a non-league game against a top-25 contender in Muhlenberg, it’s no surprise that Wilkes ranks in the top 60 in all of Division III in toughest schedules. “We have to be ready week in and week out for high level competition because there is no week off in the MAC,” Brown explained. Brown is excited about the core group of returners who now have a year experience under their belt with the new mentor at the helm. Add in a talented and deep freshman class, and the Colonels look poised to take a step up in the MAC standings. Below is an in-depth look at the squad, position-by-position heading into the final week before the regular season begins. When Brown took over at Wilkes, he brought a high-octane style of offense and it showed from day one as evidenced by the Colonels 22.4 points per-game and 238.5 yards passing per-contest. Prior to 2014, Wilkes was known more for their grind it out style of play usually topping the league in rushing attempts and yards. With the spread offense in place, Brown revitalized the passing game which included more big yardage plays down the field. With a second-year starter at quarterback and top receiver and running back returning from last season, Wilkes should again be at or near the top of the MAC in all offensive statistical categories going forward. Second-year starter Ryan Dailey returns under center to lead the Wilkes offense in his junior season. After barely playing as a freshman, Dailey emerged as the starter during camp last year and progressed as a signal caller throughout the season. He threw for 2,179 yards and 13 touchdowns going 195-for-362 through the air. The 2,179 yards were the most by a Colonels quarterback in the last ten seasons. His consistency will be vital in leading the offense down the field in 2015. “Ryan has over 800 snaps under his belt with our style of offense and must perform on a consistent basis for us to be successful,” Brown stated. Marcellus Hayes will serve as the backup signal caller with the ability to both throw and run. Hayes could see time in special situations this season under center. Sophomore Tyler Wombough and freshman Giuseppe Durso round out the quarterback quartet for Wilkes this season. Wilkes continues to reload with talented running backs and this year proves no different as the position is the deepest on the offense. PJ Incremona returns as the top back after leading the team in 2014 with 306 yards and seven touchdowns. Incremona rushed for over 30.6 yards per-game in a pass heavy offense. He figures to carry most of the load in the backfield, but don’t be surprised to see coach Brown use a plethora of fresh bodies at the spot in certain downs and distances. “We are very deep at running back with six guys who can play and play valuable snaps,” Brown said. “The future is very bright for Wilkes at this position because of the mix of upperclassmen with experience and extremely talented freshmen,” he added. 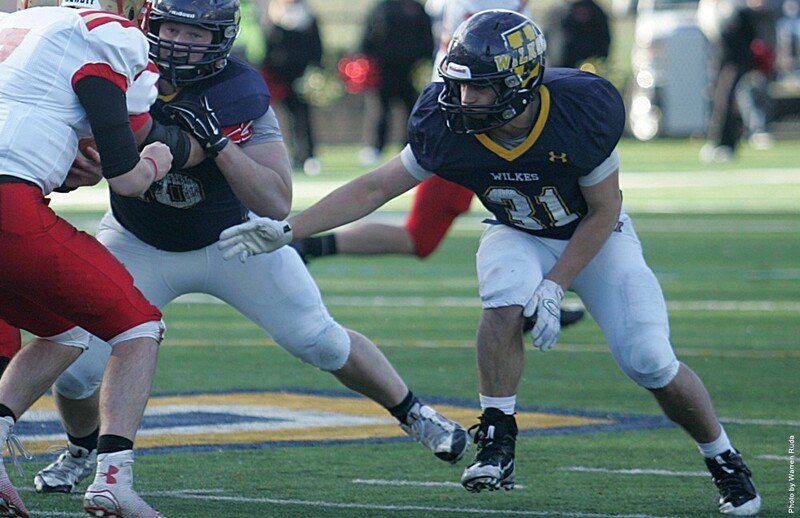 Sophomores Dustin Jones, Brandon Latierno and Tyler Derby, and freshmen Devon Fink, Sharrdan Long and Jacob Kadis will all vie for time in the backfield for Wilkes this year. Graduation hit the outside hard as Wilkes said goodbye to four of its top five receivers and top tight end from a season ago. One key return who is back is William Deemer, who enjoyed a breakout sophomore season in 2014. Deemer proved to be one of the toughest matchup on the perimeter in the MAC hauling in 36 passes for 480 yards and two touchdowns. He averaged over 48.0 yards per game receiving playing in multiple spots in the Wilkes spread formations. “Storm is very dynamic and our offense plays to his skill set,” Brown noted. “He has the uncanny ability to get free in space and find spots in the defensive coverage where our quarterback can find him for big plays,” he added. Sophomore Ryan Richards and junior Nick Brady will man the other two wide receiver spots having seen limited action last season. Both can run the deep route or work inside the hash marks in short distance throws. The duo combined for five catches for 25 yards last year. Other players vying for time at wide receiver include Kevin Russoniello, Aaron Coyne, Zach Bogoly, Aidan Brosious, Trevor Wilson, Jared Novitski, Brett Ribellino and Isaiah Hinton-Gray. The tight end spot took a major hit with First Team All-MAC selection Jeremy Hartman graduating and moving to the Colonel coaching staff. Looking to fill Hartman’s shoes is sophomore Garrett Armstrong. At 6-3, 195, Armstrong possess the size and skills to excel in the Colonels aerial attack as well as provide sound blocking in the run game. Newcomers Steven Whalen and Mike D'Anjolell will also see time at the position. The offensive line is filled with a lot of familiar faces and will be led by junior center Ryan Dupree and senior right tackle Cliff Francis, both two-year starters. Dupree’s season was cut short due to injury last year while Francis was a mainstay on the line playing in eight of the ten games a season ago. “Ryan is a great leader on our front line of the offense and serves as the quarterback of the unit,” Brown said. “Cliff has moved around the line playing both guard and tackle for us throughout his career and continues to be consistent,” he added. Senior Lucas Amarose will man the left tackle spot and sophomore Ryan Bowman will serve as the left guard to complete the Colonels left side. Junior FJ Constantino who played the center position as a freshman, will start at right guard. Adding depth to the line will be Matthew Helwig, Britton Knosp, Nicholas Rhinesmith, Christopher Thomas, Kyle Troch, Anthony Dex, Stephen Kovacic, Mason Carl and Joshua King. Similar to the offense, the Wilkes defense was in a learning year last season with the new leadership of defensive coordinator Cole Glennon and his aggressive, high pressure blitzing packages. Seven starters return to the unit with all but two seeing time on the field a season ago. Playing with three down linemen and four linebackers, the Wilkes defense did have success creating 14 turnovers and collecting 25.5 total sacks throughout the 2014 season. Much of the aggressive style will remain the same and with the experience back at all three levels of the defense, Wilkes should improve on all of its team statistical categories in the MAC leading to opposing teams leaving the field after three plays. “We expect to be at the top of the MAC statistically in all the defensive categories with the guys we have coming back,” Brown noted. “It’s no secret why our three captains all came from the defensive side of the football”. Wilkes boasts two of the best defensive ends in the MAC with the return of Michael Fitz and Jason Ugwu. Ugwu earned his second straight All-MAC Honorable Mention selection last season and is poised for a stellar senior year in 2015. He finished with 31 total tackles (22 solo and nine assisted) while finishing second on the team with 3.5 sacks and 9.0 tackles-for-loss. His size and speed creates havoc for opposing tackles. Fitz was just as impressive as a sophomore last season posting 20 total stops (12 solo and eight assisted) while finishing with 2.0 sacks and 5.5 tackles-for-loss. The duo also combined for three forced fumbles. Dominic Ammirato will man the middle of the defensive front playing at nose guard. Ammirato posted 18 total tackles (12 solo and six assisted) with 2.0 sacks last season. Richmond Owusua, David Bernhart and Robert Moyer will add depth to the defensive front three for Wilkes. Another talented and deep position on the defense, Wilkes returns two of four starters from last year to their linebacker core. Second Team All-MAC selection Tanner Stengel returns to lead the unit after a breakout sophomore season. Stengel showed his promise on the Colonels defense finishing the season as the league's top tackler with 102 total stops in ten games played. He averaged over 10.2 tackles per-game while recording 10.0 tackles-for-loss and 3.0 sacks from his inside linebacker position. “Tanner is one of the top linebackers in the league and continues the tradition of great linebackers here at Wilkes,” Brown said. “He plays downhill and uses his quickness and football IQ to make plays all over the field”. Senior Michael Paskas is back to man the other inside linebacker spot following a junior year where he finished with 33 total tackles including 23 solo and ten assisted stops. He also got it done in pass coverage posting three pass break ups. Anthony Trotta, Kyle Belle, Lukas Wood and Jordan Stiles will all vie for time at the two other linebacker spots in the middle of the Wilkes defense. Wilkes is steadied in the secondary thanks to its two returning starters at safety in Jared Powell and Isaiah Robinson. Powell was a playmaker on the defense all season last year finishing with 53 total tackles, 36 solo and 17 assisted, and a team-high three interceptions. Robinson was just as impressive as a rookie a year ago, starting in all ten games making 36 total tackles including 26 solo stops. “Jared and Isaiah will anchor our last line of defense in the secondary both in the pass game and run game,” Brown stated. “They both have the ability to cover receivers down the field as well as help us in the box in the run game,” he added. The corner position may be the biggest question mark on the defense as both corners from a year ago are gone. Ondre Roberts and Tyheed Jackson, both upperclassmen, have emerged out of camp as the starters. Rookies River Johnson and Neojoe Lughas are both talented in pass coverage and will see time at the spots as well in their first seasons. Michael Murphy and Michael Legg will also vie for time as reserve players at both safety positions in the Colonel secondary. Bryan Mellon returns as the Colonels punter and will assume kicking duties in 2015. Carl Van Glahn will serve as Mellon’s backup. Wood and Whelan will provide the long and short snapping services for Wilkes. Wood will serve as the long distance snapper and Whalen as a short snapping specialist. - Wilkes will be on the road more than at the friendly confines of Schmidt Stadium this season with just one home game in September and none in November. The Colonels are home three of four weeks in October to round out their schedule. - Homecoming is set for Saturday, October 3 against Widener University. Wilkes will honor the 1975 men’s lacrosse championship team as well as present the annual Ancestral Colonel Award. - The annual Mayor’s Cup game against cross-town rival King’s is scheduled for the season finale Saturday, November 14 at McCarthy Stadium. - ESPN Williamsport (1050 AM, 104.1 FM), now in its sixth year partnering with Wilkes, will be the official voice of Colonel Football over the radio at all home and away contests. Mark Inserra will serve as the voice of the Colonels in both football and basketball in 2015-16 replacing Joe Vasile from a season ago.